Order now for guaranteed delivery before December 25! The 2018 NY Yankees have hit more home runs than any other team in MLB history! To commemorate this great accomplishment, Big Time Bats has released this special team signature bat. 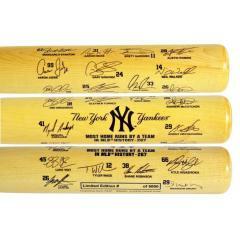 The bat features the facsimile signature of every player on the Yankees that contributed to this amazing record. 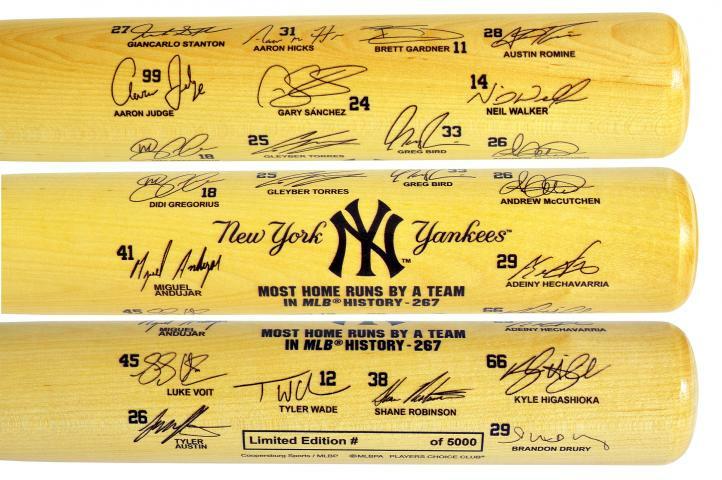 The bat also features the Yankees' logo and acknowledgment of the record. These bats come individually numbered and will not last long so order yours before they sell out! Due to the limited nature of this offer we must charge your credit card for the full price immediately upon taking your order. This policy ensure we reserve a bat for you. We will confirm your order by email. This bat is not game used. This bat is officially licensed by MLB and MLBPA. Please allow 4 to 6 weeks for delivery.